Gamers and enthusiasts are always looking to speed up their prized PCs, and one way to reach such ends is to find the perfect pair of overclockers DDR. It's a tough search for certain, but the rewards can be very fulfilling in the long run. Choosing a set of DDR modules that handles nice timings and high speeds are just some of the important criteria we look for, the other is obviously price. In this review, PCstats will be testing out a set of 512MB modules of OCZ's PC3200 Platinum Edition which are priced at $405CDN. You may already be thinking the OCZ PC3200 Platinum Limited Edition memory is "only PC3200," and why would anyone want a set of those DIMMs instead of a pair of "PC5000 Ultra Extreme Terminal Prejudice 2 DDR?" Well, if you're a seasoned overclocker you know what to look for when it comes to memory... and that little nugget just happens to be the Winbond BH-6 DRAM this set of OCZ memory use. OCZ has been adept at predicting market trends and so they have focused on providing DIMMs with aggressive memory timings (for example 2-2-2-5/7 in this instance). As we have shown in a previous Memory VS Bandwidth article, timings play an equally important role in terms of overall performance as pure speed of the DIMM. According to OCZ these two 512MB PC3200 DIMM's are rated to run at 200 MHz FSB with timings of 2-2-2-7, with a voltage of 2.7V. That is 0.1V higher voltage than other PC3200 DIMM's run at but acceptable(JEDEC list 2.6V as the nominal voltage for PC3200 DDR). The nickel plated copper heatspreaders do nothing for performance, but they do help shield the DIMM's from physical damage during handling. The individual DIMM's are double sided and sport 16 256MB DRAM each DIMM. So what's so special about this memory? Ask around in any forum, or find an enthusiast and get their opinion on Winbond BH-6/5 DRAM and you'll no doubt hear some tall tails about its "legendary" overclockability. You see, the great thing about the Winbond DRAM is that they not only clock high, they also tend to run that way with tight timings and a modest voltage increase. If you're a bit more extreme and are willing to subject your memory to higher voltages (which really does has the potential to damage your memory) you'll really start to see this memory fly! For instance the Winbond BH-5 DIMM's I have in my computer at home has been running at 3.4V pretty much 24/7 for the last year and they can easily do 250+ MHz FSB while maintaining 2-2-2-5 timings. As you can guess at that speed with those timings, it simply walks over anything else that's out there on the market. Of course most motherboards on the market only allow for up to 2.8V which is the maximum safe voltage to use without dramatically decreasing the life expectancy of your memory investment. After all the correlation between voltage and memory speed is only to stabilize... increasing the voltage you apply to a DIMM is not the same as increasing the clock speed. It does not make your memory work faster (We're stating the obvious I know, but it is often misunderstood), and it's always best to use the lowest possible voltage increase to achieve stability. Bottom line, only use the higher voltages if you're absolutely sure about what you're doing! 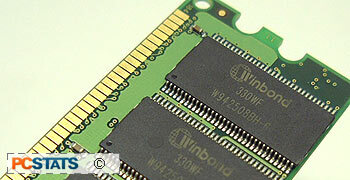 While there is an official speed difference between Winbond BH-6 and BH-5 DRAM, it seems to be primarily on paper. In terms of timings and scalability, BH-6 DIMMss act almost exactly like BH-5 DIMMs in my experience. 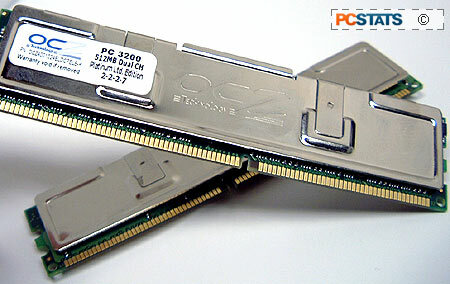 If you find some DIMM's with BH-6 DRAM do not shy away simply because it only has an official PC2700 (166 MHz) rating!